I do what I do because of the lives I change day to day. Small changes can create a impact on one's life. I become in depth and personal with my members and clients and I value each and everyone of them. We build a bond and end up with a life changing experience. I make sure that I am full-filling their wants and needs in their health. I enjoy teaching, coaching, and above all else seeing results. 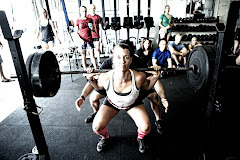 Lately, there have been huge successes in the CrossFit Round Rock Gym. My spot light for the week is Priscilla. 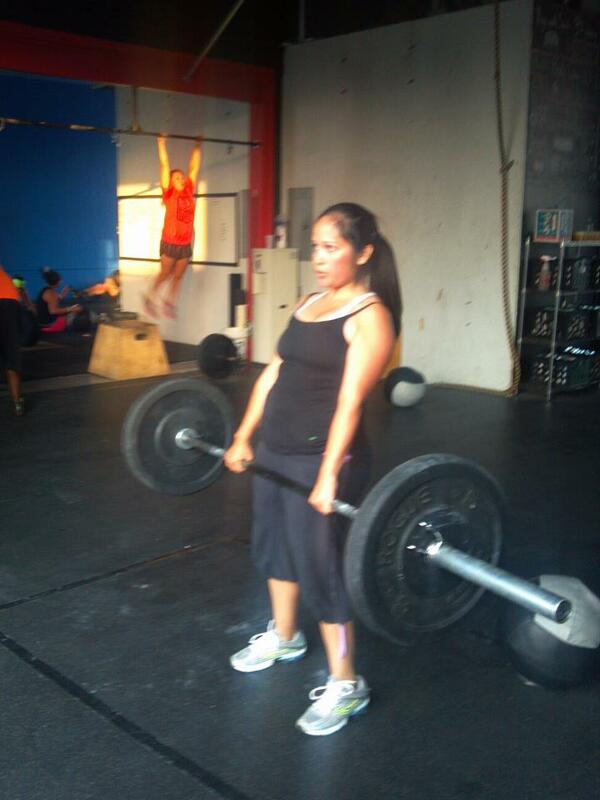 She has been with us for one month and already has dropped 5% body fat and she PR'd her back squat from 95lbs. to 100lbs. She is improving everyday and she is driven to accomplish her goals. I'm so very proud of Priscilla. Well, yesterday, I made a very important decision. I was very reluctant to do it, but I did - I walked in the door of global gym after 12 years of membership and terminated my membership. Yes, I actually belonged to a gym for 12 years! Strangely enough, you wouldn't know it by looking at me. I'm a yoyo girl. Sometimes I'm on it, running 3 half marathons in a given season and attending body pump classes. Sometimes are like this past year- one of my off years. I stopped taking time out for me and concentrated on family and work. I didn't think it was possible to do all three, but it is! Thankfully, I have a very supportive (and active) husband. After hearing so many great Crossfit success stories from friends it did not take much convincing to get started. 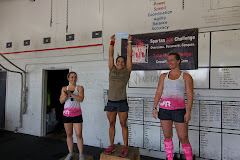 He knew I was feeling down about myself and knew that Crossfit was going to be the right fit for me - and it has been. In one month, I've lost 5% body fat - body fat??? Percentages???? Not once did global gym ever APPROACH me about this. Yes, it was advertised, but I was never given the one on one attention that Crossfit gives us all. The moment I stepped in the doors, I felt comfortable. THAT was the biggest obstacle. I've never wanted to work out in the section of the gym where the guys lifted heavy weights and stared in the mirror. I was too intimidated. I figured I'd look like a fool with my 10 pounds on the bar. lol At Crossfit - even taking classes with the "beasts" was no problem. EVERYONE has been so encouraging. EVERYONE. From coaches to the girl next to me on the box. Newbies and vets. Now that I had myself in the door, I had to work on my eating habits. This has been difficult because I LOVE sweets and have never - yes, NEVER been big on veggies. Ask my organic eating sisters or my salad for lunch team mates at work. I'm constantly the brunt of all jokes in this department. My brother in law even asked who was going to eat the veggies we were growing in the garden. Well, after V made me send her my daily logs, I realized how much I WANTED to snack and WANTED to eat - even when I wasn't hungry. Just bored. And I realized what has been missing from my diet. So, what have the biggest changes been? 1. FRESH Veggies -I'm eating more veggies - yup - we even have a garden in the backyard. I was doing it for my two boys (3 and 5), but now I'm eating them, too. 2. Water -I'm drinking more water - started out with changing out my lunchtime tea to a glass of water, and now I'm drinking more throughout the day. 3. Reduce sugar -I exchanged my sweet n low and creamer for sugar free/GF creamer and one tsp of raw sugar. 4. Healthy snacks-I freeze yogurt and make little yogurt chips for snacks. I also have almonds, apples, carrots, or the like. 5. I pass up on the cheesecake (my favorite) and ask for something like sorbet at the restaurant (if there is even room). 6. And the margaritas - I love them - but I said goodbye. Now, I'll have a glass of wine here or there. I really did cut back though. Crossfit, right? ;) No, it doesn't stop there. I go for a short half mile walk with my pups every day after crossfit. A little bit can go a long way. Also, I try to do situps while I'm watching tv with my kiddos. I have stairs in the house so I try to run up the stairs each time I go upstairs - every bit counts. I said I was a runner. I'm starting up again. Not too far yet 2-3 miles (bad knees), but I'm trying to get out 1-2 times a week outside of my crossfit days. And if you get a chance protein shakes and SPARK really do help! Really, talking with people who need the motivation is motivation itself. I love talking to my coworkers who are also motivated to get healthier. As long as you surround yourself with people who support you and want what's best for you, you can do it. You might just encourage someone else to take that step with you. Thanks to V and Mark for all your work! Crossfit rocks. Each day I come home, I'm ready to get back. It's been enjoyable yet challenging. Imagine that. And the fact that I'm meeting new people has been great. Anna (@Anna_Bergeron) mentioned you on Twitter! nick quintela (@nquintela) has requested to follow you on Twitter! Platinum Box (@MyPlatinumBox) has requested to follow you on Twitter! Landon Adams (@Landoncfrr) mentioned you on Twitter! Perf. Blood Test. (@PerfBloodTest) has requested to follow you on Twitter! Adrien Rudesal (@AdrienCFRR) mentioned you on Twitter! Andre E. Enriquez (@DREiamcrossfit) has requested to follow you on Twitter! wadehodges (@wadehodges) has requested to follow you on Twitter! Mark Manning (@Markcfrr) mentioned you on Twitter!